2) Fill out the online form below. •	Most new schools order this package to get off on the right foot. Prices are discounted 13%. •	This package includes Lead Curriculum with Character Movie Set, 25 textbooks, 25 workbooks, DVD training & poster set. •	Schools might still need additional teacher manuals for additional teachers and more textbooks and workbooks for students, but the starter’s package fits the needs of the first classroom in a school. 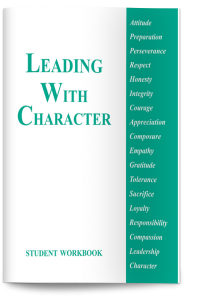 This research-based curriculum is designed to improve the character and leadership traits among high school and middle school students. While some schools use this as a stand-alone course, others integrate it into their core classes. This curriculum utilizes a consistent weekly format of ethical dilemmas, basic skills, leadership principles, lectures, readings from the Role Models text, current events, character movie segments and weekly writing assignments. The curriculum also includes a day-by-day lesson plan and a CD that allows you to fit the lessons to your specific needs. In 2012, we added a weekly blog to bring current events to light as well as virtual lectures on 16 leadership principles. A set of 18 character-based movies is included with the purchase of the curriculum. You get the entire movie to use as you see fit, but to help with time constraints, selected scenes are identified to target the character trait of the week. These selected scenes and discussion questions accompany each movie. Click here to see the list of the character-based films included. To provide a deeper understanding, we are providing an entire module — a “week’s” worth of lesson plans. This is the Week 15 Module on Responsibility, which is paired with the topic of Employability and Workplace Skills. Click here to view the Week 15 Module. Additional teacher manuals are necessary if more than one teacher is teaching this as a course. For example, if a school is using 5 teachers to teach a freshmen seminar class, 4 additional manuals are needed after the Lead Curriculum with Character Movie Set is purchased for the first teacher. In other words, a school cannot order one Lead Curriculum with Character Movie Set and copy the manual off for multiple teachers. Also, additional manuals cannot be purchased unless you have already purchased a Lead Curriculum in a previous order, or are purchasing one with your current order. 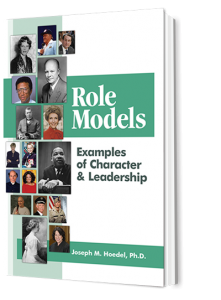 This book highlights 17 individuals who exemplify one of the different character traits covered in the curriculum. As students immerse themselves in the character trait of the week, this textbook allows them to read about great Americans who exhibit each trait. The hope is that the students will begin to look up to and emulate these individuals. Each chapter is 10-12 pages in length. Quizzes for each chapter along with a final exam are found in the curriculum. This book can not be copied — most schools get classroom set(s) for the students to read. This workbook contains every worksheet that a student uses over the course of a semester. This workbook keeps the students organized and eliminates the need to make numerous copies. This is not available without the purchase of the Lead Curriculum with Character Movie Set. The research package involves your students taking a pre-test at the beginning of the semester/year and a post-test at the end of the semester/year. 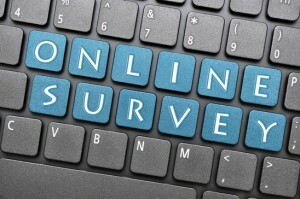 We will provide you with a research report on 84 variables, allowing you to measure the growth of your students. A set of 17 posters are available to display in the classroom or around the school to reinforce positive character. Each poster features the role model, quote and trait of the week. Dr. Joe Hoedel, author of the curriculum and the textbook, or a certified teacher who has taught the program for more than 5 years, provides trainings for the teachers who will use this curriculum. They are happy to travel to your school to provide this training. The goal of this training is to make sure that each school gets off to a great start, understands all aspects of the curriculum and uses the best teaching strategies to maximize the learning of each student. They also provides a larger staff development for all employees that focuses on improving school climate via character education and becoming a role model for students. 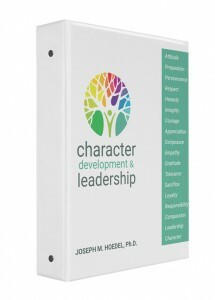 This is a 2 hour training with the author of the program, Dr. Joe Hoedel.